The staff at Gold River Sports Club welcome the change. Photo courtesy Spare Time Sports Clubs. GOLD RIVER, CA (MPG) - Gold River Racquet Club, the 33 year old club built in 1985, has changed its name to Gold River Sports Club. 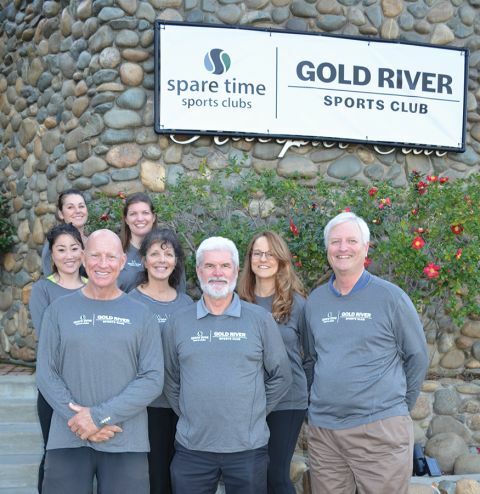 Gold River Sports Club, which is part of Spare Time Sports Clubs, has led the Sacramento region in innovative sports and fitness programming for decades. This neighborhood club has continued to increase its offering to stay up with the changing times. Over the years Gold River Sports Clubs has added; Swimming Pools; Junior Recreation Swim Team; Cardio Exercise Equipment; Weight Circuit; Free Weights; Squash courts; Dedicated function training area to include TRX; Pilates Reformer Studio; Personal Training; HIIT; After school programs; Play Center and Kids Club; Summer Kids Camp. They have also added a full range of group exercise classes from mind body, weights, cycle, dance, aqua, spin and much more. So what does the name change mean? Gold River Sports Club will continue to build on the strength of tennis programs, which have had some incredible athletics over the years and include National Tennis Champions and Championship Swim Teams. Additional emphasis will be placed on enhancing fitness services and other sports programs that broaden their appeal through the implementation of new programming technology.